Remember Children and Adults can have seizures because of metabolic disturbances, trauma or being in a febrile state. This does mean they have epilepsy. Epilepsy is a condition characterised by the tendency for recurrent seizures. Presents when at least 2 unprovoked seizures occur >24 hours apart. 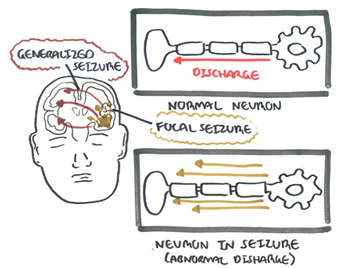 There are many….many causes of non-febrile seizures, one of which is epilepsy. Remember Prolonged seizure and or repeated disease of antiepileptic’s may lead to airway compromise and breathing difficulty. Partial or Focal seizures is now known as retained consciousness seziures. Partial seizures start in a focus in the brain. The focus may be the site of previous cerebral damage. Partial seizures may be motor, sensory, automatic or psychic. Partial seizures may occur with or without impairment of consciousness and awareness. Partial seziures are divided into simple partial or complex partial. Remember Partial epileptic seizures are classified as either simple partial or complex partial. Whereas, febrile seizure is classified as either simple (generalized seizure) or complex (partial or generalised). GETS CONFUSING! Absence Seizures (petit mal) Sudden cessation of motor activity or speech with blank stare and blinking. uncommon <5 years of age. No aura and lasts usually <30seconds with no postictal period. 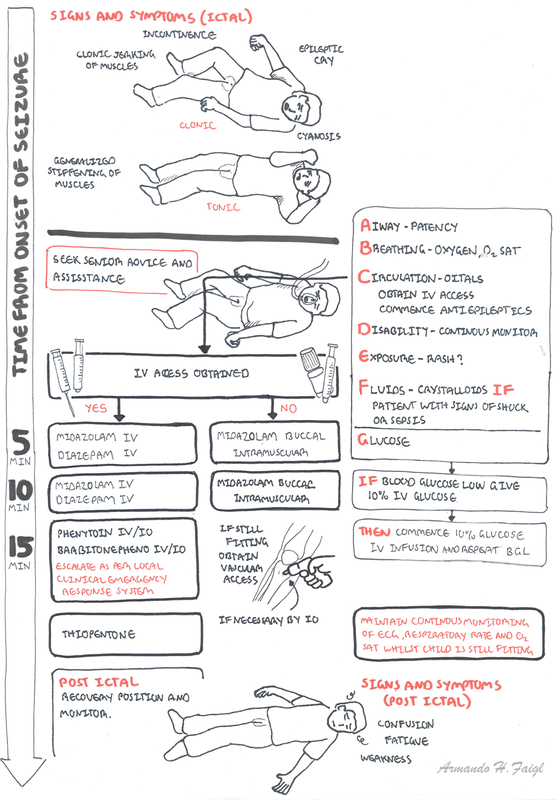 Myoclonic Seizure Repetitive seizures – brief, symmetric muscle contraction and loss of body tone with falling over. Atonic Seizure Known as drop attacks. Sudden decrease in muscle tone makes a child lose postural control and drop to the floor. Idiopathic infantile spasms “West syndrome”: a severe epilepsy syndrome composed of the triad: infantile spasms, hypsarrhythmia on EEG and mental retardation. Side note Depending on the type of epilepsy, one to several years free of seizure are generally required before anti convulsants are withdrawn. Seizures lasting a few minutes and are self-limiting only need monitoring. 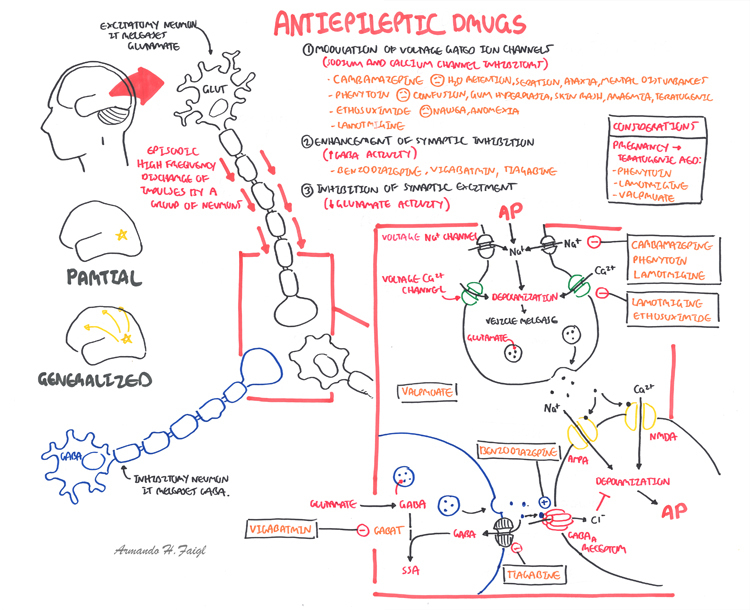 Prolonged seizure and or repeated disease of antiepileptic’s may lead to airway compromise and breathing difficulty. Remember after the first afebrile seizure, only 1/3 of children experience further episodes. Overview Seizures are common in the first month as a result of birth injury, metabolic and infective causes or developmental abnormalities. Hypoxic ischemia encephalopathy is the most common cause; seizure usually present within 12-24 hours after birth.